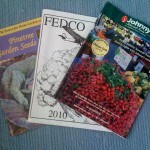 Finally completed the 2010 seed orders last weekend. Between perusing the catalogues,inventorying the left over seeds from last year and deciding on the best varieties to buy,the annual seed order has,at least in my mind,become a major undertaking. 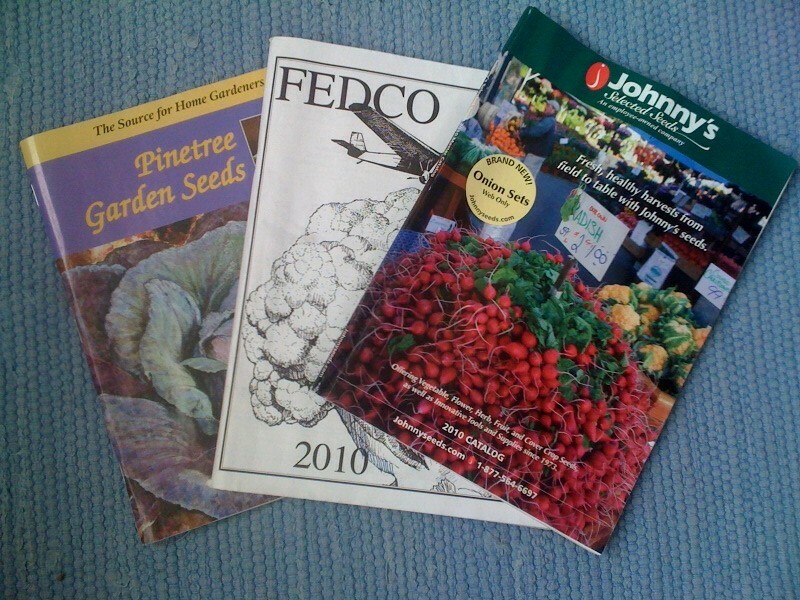 I try hard not to peek at the seed catalogues that arrive before Christmas and then plunge into them after New Years to see what’s new and that I might have overlooked in past years. That’s the fun part. Making decisions is harder. To avoid over-complicating the process,I ordered only from the Maine triumvirate – my old standbys. Fedco –entertaining catalogue,large inventory – prices mostly under $1.50/pkt. For seeds not available from any of those three,I shop at the Gardeners Supply store in Burlington. They offer huge range of varieties in festive seed displays featuring unusual sources including some never seen European and Asian seed companies. Fun, but if you share my approach of growing a little of a lot,buying seeds at a store will get expensive. We plant throughout the year, with at least 100 varieties of seeds, including multiple varieties of many veggies. It’s a delight to have the full palette of lettuce colors,smooth and spikey greens for every season,and tomatoes big and small,round and oval. Plus,with eight types of peppers,I can pretty much ensure that that whatever conditions the summer brings, we’ll get production from at least one. Last year was my worst pepper year ever but still the two serrano plants pumped out enough of the little peppers to freeze and use throughout the winter. I pick and pop them into the freezer bag,then take them out individually and while still frozen,cut them up for a fresh picante taste in salsas and currys. Now onto the next set of garden tasks!